Fantastic Low Rates Over the New Year Period! 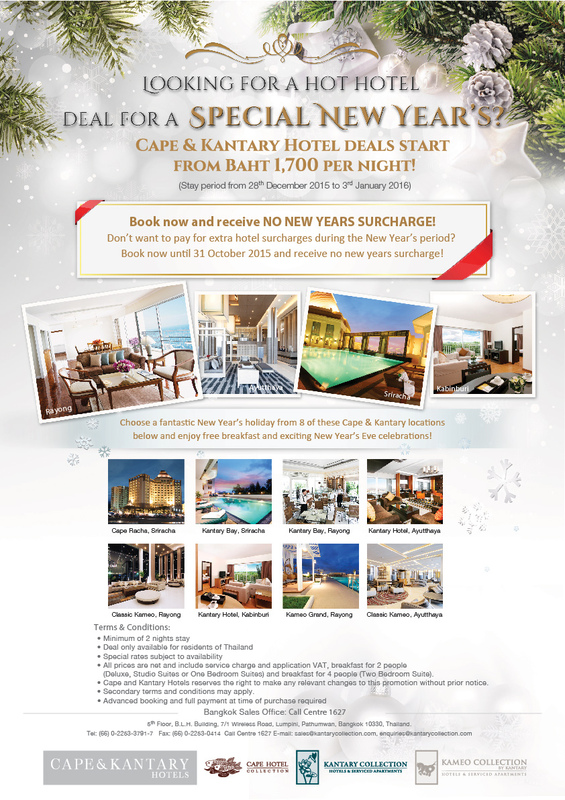 Book now until 31 October 2015 and receive no new years surcharges! If you are in need of a relaxing and rejuvenating getaway over the New Year’s holiday period from 28 October 2015 to 3 January 2016, book an unforgettable stay at selected Cape, Kantary and Kameo Hotels over the upcoming New Year’s holiday at remarkable room rates that include breakfast. All of our hotels provide unsurpassed service, an extensive range of facilities and lively New Year’s Eve celebrations. Book now and receive no New Year’s surcharge and enjoy the splendour of a beachside holiday at Kantary Bay, Rayong; a stay among the breathtaking ruins of Thailand’s former capital city at Kantary Hotel, Ayutthaya; a sporty holiday with easy access to Thailand’s best golf courses at Kantary Hotel, Kabinburi; or the luxury and serenity of Cape Racha, Sriracha – with deals starting from baht 1,700 per night! วันที่ 15 กันยายน 2558 เวลา 19:03 น.